Nelson Cruz passed his physical, and his two-year deal with the Rangers is worth $16MM plus incentives, MLBTR has learned. The ACES client had an arbitration hearing scheduled for next week. Cruz, 31, hit .263/.312/.509 with 29 home runs in 513 plate appearances last year, adding eight more homers in 70 postseason PAs. The right fielder's arbitration case seemingly had some bearing on those of Adam Jones and Alex Gordon, who remain unsigned. Cruz will be eligible for free agency upon the completion of his two-year deal. His .540 slugging percentage since 2008 ranks sixth in MLB among those with at least 1500 plate appearances. Health has been the only obstacle for the late-blooming Cruz, who has averaged 120 regular season games over the past three years. The Rangers extended shortstop Elvis Andrus yesterday, so Mike Napoli is their only remaining unsigned arbitration eligible player. Napoli's hearing is scheduled for Wednesday of next week, with a $3.2MM salary spread. Good. Now get let’s hope Hammy has a stellar year so he’ll be a Type-A free agent next year. Go Rangers. From the new CBA, Type A or B has no meaning any more. The ratings system was eliminated. But there are new rules that can get a team 2 draft picks for losing a stellar free agent. I called that Type-A, I don’t know what the new rules call it. IIRC, you must offer a guaranteed 1 year deal at least equal to the average major league salary. Roughly 1 year/ $11 million this year. Quality of free agent (good, bad, stats, etc.) is irrelevant. If Hamilton bats .200 this year and doesn’t hit a single home run, but the Rangers guarantee that one year offer and he signs elsewhere, they get compensation. There is no “Type A” or “stellar year” or anything like that any more. Sign Naps to a 3-4 year deal and then decide on Hammy. I think it’s going to take a 5yr-60mil deal to lock up Napoli. We should go ahead and lock up Holland and Harrison to long term deals also. As for Hamiliton, I’m hoping for a 4yr-85mil type deal, seems fair for both sides. My biggest worry is Kinsler, as he is the most talented 2nd basemen in the MLB( better than Pedroia imo). I’m hoping for a 5yr-75 mil type deal but I’m sure he will want more. Kinsler is a must sign! You forgot about Robinson Cano! The likelihood of all of these players being extended before free agency is not that great. I thing Cano and Petey are both better 2b than Kinsler. Not saying Kinsler isn’t great but Dustin has never had an OPS lower than .800 in a full season and is better than Kinsler defencively in pretty much every metric. I’m not saying by a wide margin but Kinsler is a wizard on defense and was in the 30/30 club last year. All of that while playing injured( he had surgery to fix the problem this offseason). Cano, Pedroia and Kinsler are almost neck and neck. If I were starting a team they would be my top three for sure. The real edge that Pedroia has is that he gets on base more. And is a bit better on D. But there is no real drop off between the three of them. Pedroia is the best 2B in the league, but Cano is behind Kinsler. Just because he hits for higher avg. than Kinsler doesn’t make up the difference in defensive ability. I’m glad you got a good laugh. See if you can stop chuckling long enough to look up their stats. Kinsler and Cano’s WAR is almost identical the past 3 years combined. Kinsler has twice been a 30/30 player. Kinsler’s OBP has been higher 2 out of the 3 past years (2010 they were almost identical). Cano has more of a green light than Kinsler does due to Kins hitting lead-off. Okay I looked up the stats. Both have a similar WAR. Cano is a better all around hitter as he hits for both average power and he knocks in runs but he does have a low on base and seems like an average defender. Kinsler steals bases, plays pretty good D and also hits for power, gets on base. His weaknesses are low BA and I dont like his home road splits .214 on road even though he hit for power on the road as well. Cano would put up stats in every ballpark as his numbers are the same home and away. In the end if you gave me a choice I would choose Cano. And I would take Dustin. I’m not being bias. Kinsler is better than Cano defensively. I shouldn’t be blowing anyone’s mind with that statement. Maybe you should be checking your stats bro. Cano had more Putouts, Assists, even fewer errors than Kinsler which adds up to a better fielding percentage. Fielding percentage? When you start using that talk you start giving people like Jeter Gold Gloves. Okay Napoli before this year was .240 hitter. He hit .250 in the first half of the season then went bannanas the rest of the season. SO you want to pay him 12 million dollars a year to a guy who has only had a half of year of really good basball. Yes I would. 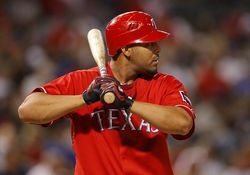 He has had stellar postseason stats with both the Angels and Rangers. I know that doesn’t matter much to people but it shows he can handle pressure. Another reason is he’s in more of a hitters park then Angel Stadium. If he can hit .270+ with 20-35 bombs a year while playing great defense at catcher, he will earn his contract. Keep in mind he was above average defensely(lol not sure if spelled right) last year. Good we locked up Andrus and Cruz, now sign Napoli to a 3 year deal. Then wait on Hamilton, see how he performs this season. Even though I love him as a player I am not for signing a injury prone guy to a long and big money deal. Should we be expecting an editorial from Mr. Dierkes on how this extension is a raw deal for the Rangers?